Happy Sunday, July 26th, familia y amigos! We are getting so CLOSE to our wedding day, and are so pumped. Josh and I are very much ready to start living this life together, and we are thankful that we don't have much longer to wait. Things are moving and grooving and flowing and growing! :) I will first say, we would not be where we are if it weren't for the many precious people who have helped us. It takes a village, and we are embracing and indebted to our village. I've thanked them a thousand times, and I will thank them again and again for loving us so much to pour themselves into making August 8th just what it needs to be. And I'm telling you, folks, it's gonna be par-tay. Two weeks ago, Josh and I were in Lubbock for the lovely Amy & Brian Jones wedding, and it was perfect. They are absolutely beautiful, and I'm so excited for their sweet life together! Then we made our way through Tulsa, grabbed bunches of my stuff & Millie (Hester dog/baby), and road-tripped it to Nashville! We were able to begin getting all of our WONDERFUL gifts settled, and continued to make that house a home. Josh is home for three days right now, and then the next time both of us see it will be when we come back from our HONEYMOON! Josh and I are very thankful for freedom. Freedom in the country we live in. Freedom to choose who we want to marry! Speaking of that... we are getting married in less than 5 weeks! WOOO!! I write on this blog, not because our lives are really all that fabulous, but because there are so many precious folks in our lives that we don't get the opportunity to speak with on a regular basis, and we want to fill you in! It had been 6 weeks since Josh and I had seen each other-we have vowed that we will never do that again. FINALLY the day came where Josh and his lovely mother Laura came to Tulsa! Before that, Josh produced his friend Josh Rosenthal's album, played concerts at various places such as Willow Creek in Chicago, Ft. Jackson in South Carolina (http://www.youtube.com/watch?v=JsI6IYXqCEg), and lead the worship at a youth conference in Orlando, Florida. I was busy getting wedding details figured out with the help of my precious family and friends, helping at a youth camp, getting my wisdom teeth out, enjoying time at the lake with my family, and writing thank you notes to the wonderful people that have blessed us and showered us with sweet gifts. It has been a busy summer, but we are so thankful for all of the opportunities God is giving us. 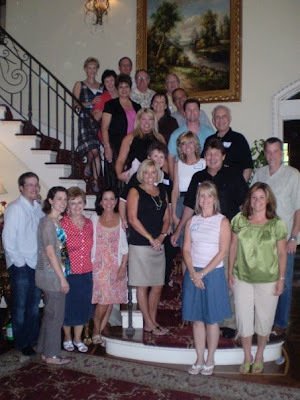 When Josh and Mama Wilson arrived to Tulsa, the party began, celebrating along with my family, our aunts and uncles, cousins, second cousins, and more dear friends. We had the most wonderful time with all of those that were present, and will be moving to Nashville beyond blessed with what the Lord has provided us through these people. Josh had the opportunity to play at Rockets Over Rhema here in Tulsa that evening, and it was some good and hot-weathered family fun. He has wrapped up recording for his next CD, and we are excited for it to come out in September! We are now getting ready to go be together in Lubbock, where Josh's younger sister will be happily wed on Saturday! I'm telling you... we are having wedding madness here between the Wilson and Hester households, but it is a great madness. Josh and I hope and pray that this finds you doing well, and enjoying your summer. God bless you, and happy hot weather! "Embrace this God-life. Really embrace it, and nothing will be too much for you. This mountain, for instance: Just say, 'Go jump in the lake'—no shuffling or shilly-shallying—and it's as good as done. That's why I urge you to pray for absolutely everything, ranging from small to large. Include everything as you embrace this God-life, and you'll get God's everything." The countdown continues... 75 DAYS! Josh does not like to count down. He thinks it makes the days go by slower. He says that if you just go through each day like a normal day and do normal things, then one day I'll just show up. Or he'll just show up. We'll just show up at the church in a wedding dress and tux and then the day will be here! I, on the other hand, count down the minutes until I see Josh next. Sometimes I use a calculator. I like to count down. So, folks, 75 days. I will do my best to sum up everything that we, engaged lovebirds, have been up to within the last three months! 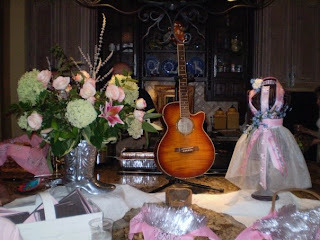 The DAY I returned to Tulsa after Josh proposed in Nashville, I found my dress :) A little excited? Maybe. But it truly was a blessing, because it was IT! So we checked that off the list! Not long after, Josh began touring with Big Daddy Weave for the spring. They toured until May, and it was so wonderful. I saw my first Josh Wilson concert during this tour, when I met Josh in Texarkana for the day in April. Let's just say... I fell for him- AGAIN. I came home and told Mom how glad I was that I had not seen him play a show before then, otherwise I would have been weak at the knees from the get go, and willing to say yes no matter what kind of guy he was. What girl doesn't fall for a cute guy who can play and sing?! Come on! But thank the Lord our relationship developed and found its foundations on so much more than that. God knew what He was doing placing Josh with the guys from Big Daddy Weave. It was such an encouraging time for him. All of the guys in that band have had successful, Godly marriages, and poured into Josh wisdom and advice for this road we are starting on. I finished my school semester in Tulsa, and continued to make plans with my Mama about this party that's happening in August. Josh's precious parents, David and Laura, came to visit Tulsa one randomly snowy weekend to meet my parents, and we had a fabulous time. (I shouldn't ever say random, it's Oklahoma) I went to visit Nashville for a week in March, where we had a few more premarital counseling sessions, registered, and took engagement pics. 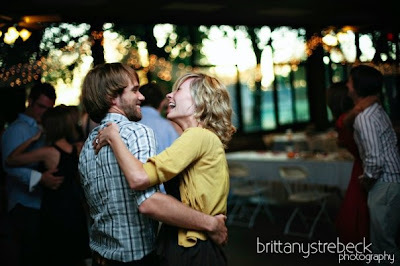 We also went to the wedding of one of Josh's groomsmen, Mr. Dunn and his lovely lady, and practiced our dance moves. Easter weekend arrived, and Josh came to T-town. It was a relaxing weekend to be together. Finally, I visited Josh as soon as school was out, and I stayed in our NEW HOUSE! That is right! We have a house! 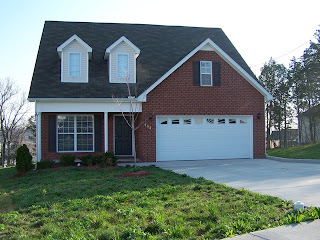 It's a little rental house in the La Vergne/Smyrna area, and it's darling. Josh surprised me with my birthday present, as well-a bicycle for each of us! We've named them Mike and Susanna. We're all just one big happy family. I got things together for school in the fall. I am now an official Blue Raider at Middle Tennessee State. We also finished our premarital counseling that week. Let's just say, Josh and I are now masters at marriage. HA! :) We are so thankful for Jamie & Suzanne, the couple that led us through that. So now we are apart again. Josh is finishing his next album, producing Josh Rosenthal's next album, and doing shows throughout the summer. I am home, working, enjoying the 11 weeks I have left with my dear family and friends in Tulsa. He will be in town, playing at "Rockets Over Rhema" on June 28th. Anyone that's in town, come on out! Thanks for reading this :) We're so excited and thankful. I'll do my best to write often! Perhaps I'll fill you in on some wedding details, some bios of those that will be apart of the ceremony, and so on. I hope you have a blessed day. Welcome to the blog of our marriage. :) The blog is under construction, and will look a little friendlier soon. In the meantime, here is a story for your reading pleasure! This is the story of Joshua David Wilson and Mary Rebecca Hester. Once upon a time, on a cool 1983 November morning, Joshua David Wilson was born to the lovely David and Laura at Union Hospital in El Dorado, AR. He was a handsome little blue-eyed blonde who soon grew a beard and played groovy tunes. God and his groovy tunes took him to Nashville, TN where he resides now. Four and half years later, in the same Union Hospital in El Dorado, AR, Mary Rebecca Hester was born to the lovely Hess and Julie Hester in May of 1988. She was a little blue-eyed blonde as well, who loved to sing and dance and listen to groovy tunes. She lived in Tulsa, lived in OKC, lived in Spain (she missed Josh the first time he came to Tulsa because she was in Spain), lived in Tulsa again, and met Josh the second time. August 7th, 2008, Becca was finishing her internship with Steven Wayne Bullard and the SHBC youth group. That morning, Steve notified Becca of the Josh Wilson concert occurring at the Riverwalk that evening. Becca didn’t know much of Mr. Wilson’s music career but had heard he was good and she wanted to spend some quality time with the Bullards, so she decided she would go. Josh almost didn’t take the gig in Tulsa that night, but thank the Lord he did. Becca was late to the concert, so she didn’t actually get to see Josh play, but fortunately got to meet him afterwards. From the moment they met, sparks FLEW. J Come to find out, they both were “PK’s”, middle kiddos, born in the grand town of El Dorado, AR, and basically had been living parallel lives until this day. To make the story short, facebook messaging lead to emailing. Emailing lead to texting. Texting lead to talking. Talking lead to ichatting. Ichatting lead to Josh visiting Tulsa a month later and the rest is history. Josh and Becca soon realized that the phrase “When you know, you know” was becoming applicable to their relationship, and were realizing that the Lord’s hand was at work in both of their lives. The two have decided August 8th is the date. The Lord is good and His will and timing are perfect. All good things truly come from Him, and Josh and Becca praise Him that He is blessing them with this love and life together! Josh is a singer/songwriter/musician out of Nashville, TN. Becca is a full-time student from Tulsa, OK. Together they are a bond of love and joy, and ready to give you hugs and high fives!